Let me set the scene. I had a pretty work-related weekend, with like 10,5 hours of my actually “free” weekend spent on the computer doing schedules. So my mood was a bit on edge, and after working the previous weekend when The Punisher actually was released, I was itching to watch my favourite anti-hero punish bad people! Oh boy, when that first episode started, when that man appeared on my screen WITH A BEARD, I was a goner, guys! I was in it until the end and I just, I love him so much! And it’s actually a bit disturbing that me and so many other women (most of you share your enthusiasm on Twitter with me and I love you all for it!) see him as this … grunting alpha male they want to take home and bang on every possible surface, because he kills people. Yet, I find all his actions to be so rewarding and peaceful that I think I will be forever alone if that’s the type of man I want in my life. But, then again, I would also gladly settle for a Jon Bernthal, yes please, thank you! I will have some time on Thursday to write my review, which I will probably want to publish after my Thor: Ragnarok review which has been sitting in my drafts for a week now. But I’m afraid I won’t have enough time.. because I actually want to re-watch Daredevil Season 2 and The Punisher before reviewing it. And I’m working this weekend AND we have a Christmas party on Sunday, so I’ll be hungover on Monday, which will waste another day. Then on the 5th I have a movie quiz thing (I have two I go to and we are most likely going to start our own one! ), and I just don’t have the time to marathon it all! But I want to, and I will because this is what my life is now. Everything is Frank Castle, and everything else is just irrelevant stuff I have to do. I usually write about it first but this week’s episode was so out of my comfort zone that it was very difficult for me to talk about it. Add to the fact that I had marathoned The Punisher until 4AM, slept less that 6 hours, and we recorded in the late evening – I was a incoherent mess. But it was still fun, and there were some surprises here and there. 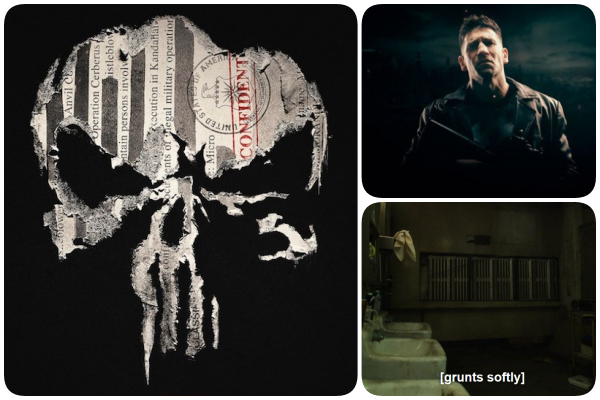 And the episode starts with me gushing about The Punisher, so I mean, everything really is about Frank Castle now. The next episode should be up today, tomorrow – this week for sure (it’s late guys and I’m again confused, I’m confused a lot these days)! Oh, and the reason I was out of my comfort zone, the theme of this weeks episode was noir! Each of us picked a noir or a neo-noir movie and well, yeah, you can imagine how dumb I sound throughout this episode. So, forgive me! There are a few movies I want to see as soon as possible, and one of them I already have tickets to. It’s The Shape of Water, which I will see on Friday! I can’t wait, it’s going to be an interesting experience to say the least. Another film I would love to see soon is Lady Bird but no official release date here in Estonia, so it might be a while before I see it. The amount of positive reviews (which also broke the Rotten Tomatoes record) is amazing and I do have a soft spot for Saoirse Ronan and Greta Gerwig! Last but not least, Wind River is also high on my to-watch list this month/in the beginning of December, so I will soon talk about it. Back in the TV world, everything is of course all about Frank Castle but I have also seen all the episodes of Crazy Ex-Girlfriend so I’ve been fully entertained this month! I first remember watching the trailer for Crazy Ex-Girlfriend and it not interesting me at all, which is why I never started watching it. Then, my flatmate started watching it and I got hooked as well. Now I’m actually behind with Jane the Virgin again though, so it’s like I can only watch two things at the same time. Oh, and I also need to watch Narcos and Frontier and continue with Riverdale and start The Exorcist and so many other shows. Yet, all I want to watch is The Punisher. Funny how life is sometimes. So what did I think of The Punisher? Well, I loved it! It’s my favourite of the entire Marvel Netflix shows and I’m very sure I will hate the wait for season 2 the most out of all the waiting I do every year. I did have one thing about it that we also sort of mention in the podcast, that I want to talk more about in my review, but it’s spoilery so I can’t go into it. But there’s so much to grab onto with The Punisher, which is why I want to rewatch the second season of Daredevil, to refresh my mind about how Castle was there versus how he was here. Because I remember loving him in there but I’m full on obsessed with him here, so I think they managed to transition Castle well into his own series. Unlike *cough* Luke Cage *cough*. I also want to make a lot of screen shots of the grunting because I feel like I could create something very beautiful with it… for my own private enjoyment which I will also probably share with you all. We will see. At the moment though, I’m Googeling Jon Bernthal’s pictures to switch my Joe Keery lock screen image to Bernthal but there are so many choices and I can’t choose!! Help! So I caught up with my challenge again and now I just have to finish 7 books before the year ends and I’ve finished 70 books in 2017! Yay, I know can do it! It’s going to be a bit of a marathon but I will pick up 5 YA adult novels and power through if it comes to it! Which isn’t a way to complete a challenge, but I already have a plan to lower my challenge to 50 books again because I want to pick up my big books next year. I also want to stop buying so many new books before I finish the ones I have now. Though, that will be the bigger challenge, because I will never stop buying books. So last week I did read only one book, Saint Anything by Sarah Dessen, but I did start two books which I’m not trying to finish. Saint Anything was pretty good, definitely my favourite reads this month. There was a romance element but it was more about friendship and finding oneself through those newly formed friendships that made the book good. I heard that it’s not the best by Dessen, but it’s the first I’ve read of her, so I can’t wait to see what else she has written. Did you really think that it was going to pick anything else? Not a chance, listen on repeat! you’re gonna love Wind River…until you are left absolutely traumatized. Most horrifying scene I’ve seen in years. I will see it soon!! Oh my word so I think The Punisher is my favourite toooo!! But everyone I’ve talked to ssays I’m exaggerating!? I just loved that I went in expecting it to be this Frank origin style story and it ended up being Jigsaw’s!